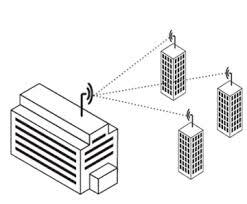 AireBeam can build private point-to-point microwave links between two or more of you buildings. Private microwave links are a much less costly way to connect two buildings that are not connected by cable or fiber. Short distance links with speeds to 50mbps can be constructed for under $800 and there are no recurring costs. Prices are higher for longer distances and higher speeds but are always much less costly than leasing dark fiber or planting your own fiber. AireBeam can supply unlicensed 5Ghz microwave radios which are perfectly reliable under most conditions unless the spectrum is in use by others. In that circumstance, FCC licensed microwave radios, although more costly, offer elimination the possibility of interference because the frequency that your microwave link will be assigned is controlled by the FCC and it is illegal for someone to operate an unlicensed radio on your frequency in the proximity of your connection. The process of obtaining an FCC Frequency Allocation is handled by one of a few Frequency Coordination firms in the USA. The Frequency Coordinator has access to the FCC's database of licensed frequencies already issued in your geographical area. By FCC statute, the coordinator must notify all existing license holders in the potential interference zone surrounding your proposed link route of your pending application, including your proposed radio type, manufacturer and model, antenna type, manufacturer, model and gain, operating frequency and transmit power. Existing license holders have the right to file a notice of opposition to your application which forces the Frequency Coordinator to conduct a more detailed RF analysis of the proposed link in the context of the existing links of the opposing party. If the Frequency Coordinator subsequently determines that the possibility of interference exists, the Frequency Coordinator will adjust the frequency proposed to eliminate the possibility of interference. The licensee pays a fee to the Frequency Coordinator and a fee to the FCC which gets the licensee a 10 year lease on the frequency for the said link route. For more information about dedicated Point to Point links, click HERE to send us your request.